How to get there: From the city of Ålesund, drive E-39 east to Sjøholt, make a right onto Hwy. 650 south and continue 31 km to a roadfork in a steep downhill section. Make a right here (direction Stranda) and continue 400 meter where a smaller road forks right. Take this road for only 200 meter, then turn right sharply uphill and drive 400 meter where the road sharply bends left. Leave the road here and continue straight ahead (fork right) on the beginning of a smaller forest road. Find parking after 50-100 meter, do not block any access. This is the trailhead, elevation 279 meter, location N62:19.132, E007:03.127. Route description: From the trailhead, continue along the forest road. Do not take the first left, but continue a few more meter to the sharp left bend of the road. 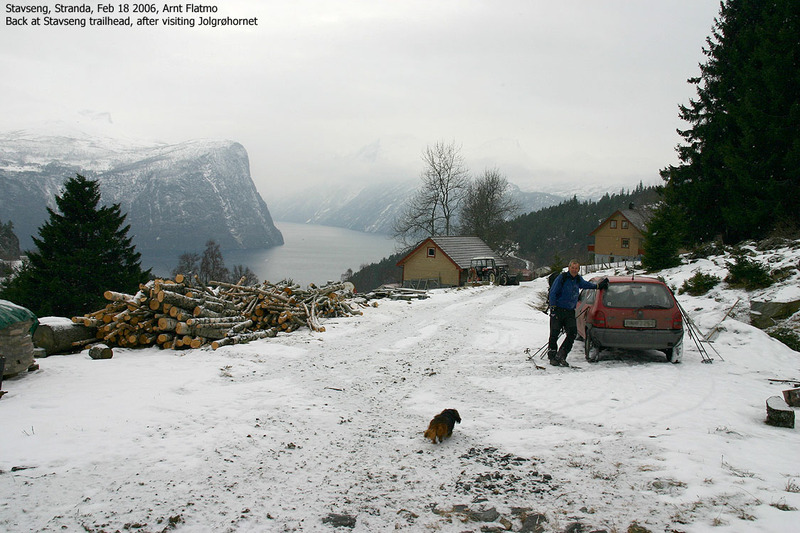 Continue gently uphill along the road to the huts at Ringsetsætra. From here, one can ski directly up Vardebakkane to point 1099, another variant is to continue above the huts for a few hundred meter, then turn sharply left, below a few rocks and gain the ridge west of Ringsetsætra. 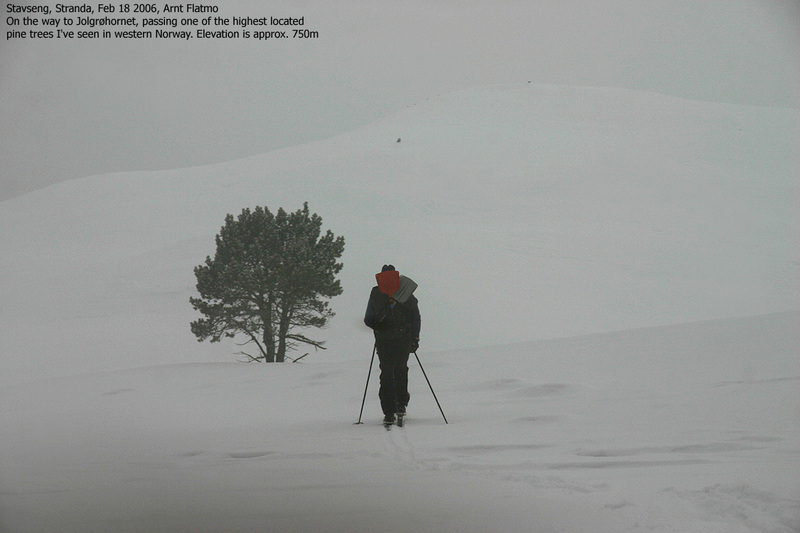 In this case, continue north up the ridge and then contour on the east side of Jolgrøeggene (985m) at about 930 meter, above the steeper slope below. Cross the saddle (928m, N62:20.490, E007:00.828) below point 1099 and climb this hill. From point 1099, the terrain is quite level before the final hill to the summit of Jolgrøhornet. This mountain is a very good peak for skiing. The terrain is nice and offers many good variations for downhill routes. Comments: I climbed this mountain with my friend Arnt Flatmo. We started at 0925, arriving at the summit at 1225, 3 hours. After 5 minutes on the top, we skied back down to the car in one hour. 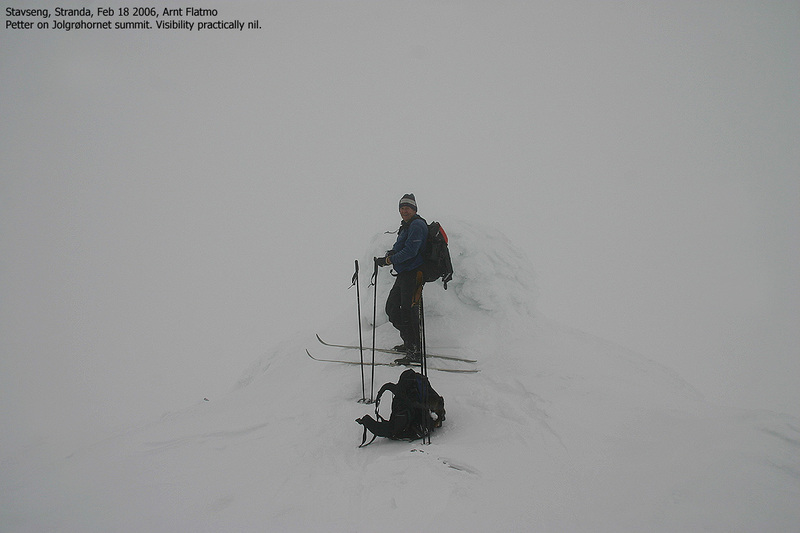 The weather was far from perfect, light snow and a cloud cover that was lower than the summit. We hit the clouds at about 1120 meter and the last part of the climb was unfortunately with very limited visibility. Except for this, the conditions were nice, 5 cm of new snow on top of older crust. No wind, just a very weak trace of it at the very summit. A lone pine growing higher than normal. The trailhead as we return.